Hack 69. Create a swap file system. Thanks for the ebook, i think is very interesting. I hope to read it entirely and comment it again when I do. Cool stuff, thanks. I like it. There are some typos like “ip-addres”, and links that are only available in electronic version. In other words, if you print the book, you will never know where a link is pointing to. It would be nice to add a footnote with target URL to each hyperlink. And it would be great to explain why would somebody want to use particular command. For example, what’s the point of using xargs in find if i can just do -exec and any command I want? it is not mentioned anywhere that xargs helps to overcome the limit of command line arguments in shell (see xargs –show-limits). In “Create a new user” section you do “useradd” and then suddenly “adduser” which is completely different command. You don’t explain when would one want to use useradd or adduser. Btw, usermod -G will replace all supplementary groups. You need usermod -a -G most of the time. Anyway, thanks for the great work you’ve done! Nice job – I’ll write a post about this in my blog soon. I’ll share it with some friends of mine, of course it’ll be very helpful, thanks! great work man…I really have to appreciate your hard work……….. Thanks for sharing your knowledge, great book. Hack 28 needs to mention what part of the package is the “ac” command. It is does not mention that is a part of psacct utility. I am in the process of going through the others.. will provide you if I some more stuff in that.. I hope you don’t mind. And not to mention, it is a indeed a nice collection. Thanks!! It looks very good! Thanks for sharing , this stuff talk about important things , thanks again dude . Congrats on your eBook release, Ramesh. Really good work. Great book, but why do you use a password? Very cool of you to share your knowledge. Thanks a lot! Great work Ramesh! I’m in love with the book. So many great ideas. Thanks a lot. 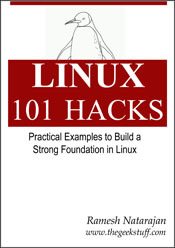 The book is outstanding … It delivers the linux commands and with ace of simplitcity.. clear example. Any body having a little knowledge in linux. can get a lot help from the book. Great book. A student of mine alerted me to your book. I have looked through it and feel that this will be very useful for my college students. Thanks so much for sharing your knowledge with others. thanks for the info, some commands can be used in ubuntu also. hi this is good way to share your knowledgd u r a great guy. is this just the 1st release of the book? is there a 2nd release? Thanks! You are awesome! Thank you for this ebook. Can you make available the LaTeX code of the book please (or at least, the minimum code so that someone can produce documents like this one)? It’s awesome. Your books sound very interesting, i’m definetely going to read it. Thank you very much! I want a good Linux book with backhand command.